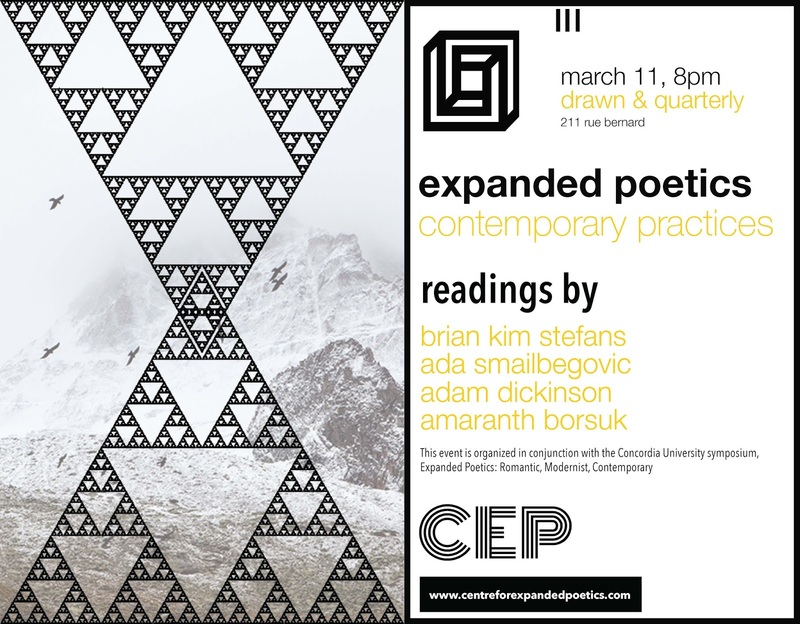 Join us on Saturday, March 11th at 8:00 pm for an evening of poetry readings by Brian Kim Stefans, Ada Smailbegovic, Adam Dickinson, and Amaranth Borsuk. This event will showcase a range of contemporary approaches to "expanded poetics," exhibiting the immersion of poetry in relationships with science, digital media, and environmental crisis. This reading at Librairie Drawn & Quarterly is a satellite event of the Concordia University symposium on Expanded Poetics: Romantic, Modernist, Contemporary. Further information on the symposium is available here.